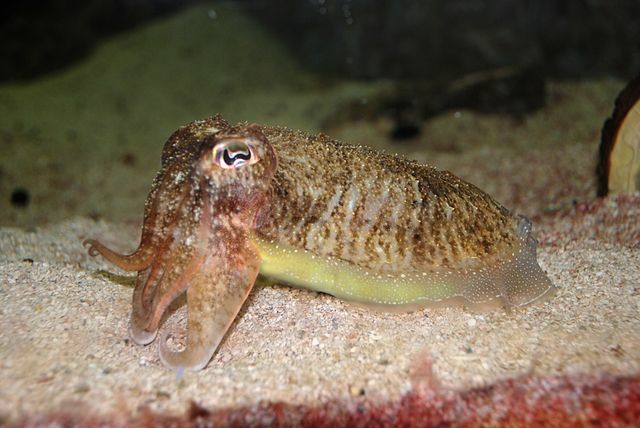 The common cuttlefish or European common cuttlefish (Sepia officinalis) is one of the largest and best-known cuttlefish species. It grows to 49 cm in mantle length (ML) and 4 kg in weight. TheBody relatively broad and somewhat flattened so as to be oval in cross section. Paired fins run from behind the head to the tip of the body, but do not join. Arms are short and possess 4 rows of suckers while tentacular clubs possess 5-6 suckers in transverse rows. Dorsal margin of mantle with blunt lobe. Individuals are capable of very rapid colour change, especially when threatened; the animal may also take the colour or patterning of its background. Tentacular club with 5 or 6 suckers in each transverse row, the median ones moderately enlarged. Swimming siphon not extending past base of club tentacles. Cuttlebone anteriorly and posteriorly rounded, with parallel sides. Colour - variable; may be black- brown, striped or mottled on dorsal surface, paler to white on ventral surface. Habitat Found on sandy and muddy substrata, shallow sublittoral and offshore to 200 m, but typically to 100 m depth.